CyanogenMod fans,brace yourselves for some pretty bad news. CyanogenMod is no more. A day after Cyanogen Inc, announced that it was shutting down, the custom ROM, which was supposed to be available until the end of the year, has been taken down already. The servers are down, and the official CyanogenMod Twitter account said that its DNS and Gerrit are offline. Some reddit users have been trying to collect the ROMs and upload them to mirrors. A hat tip from Geekiest for their efforts. But, all is not lost. When one door closes, another one opens. The open source custom ROM, has found a new home.The developers of Lineage OS, which is a fork of CyanogenMod, have announced that their own custom Android ROM, will pick up where CyanogenMod left off. The Lineage OS team, comprises of former CyanogenMod developers including the creator of CyanogenMod, Steve Kondik (co-founder of Cyanogen Inc). So it is likely that the new ROM, will be similar to the legacy that CyanogenMod leaves behind. 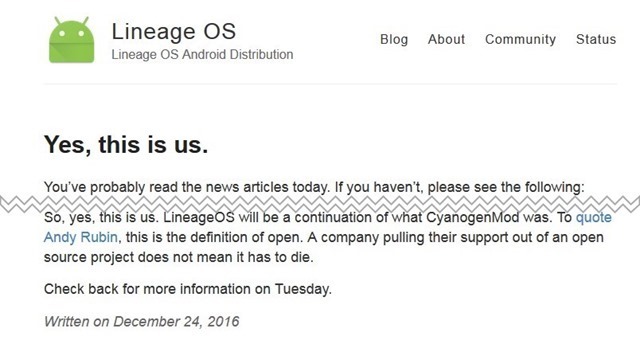 It remains to be seen, how Lineage OS will thrive, as CyanogenMod had to rely on Cyanogen Inc for funds for its servers. But we wish them the very best.